Anyone that knows me, knows that I have hoped for a long time to put out a craft book...I have patterns that I have been holding onto, in the hopes that one day...they will grace the pages of a well designed (by my husband the graphic designer of course)....sewing book of sorts. Well - the time still has not come - and that's ok - I can learn to be patient, but in the meantime I'm doing my research. 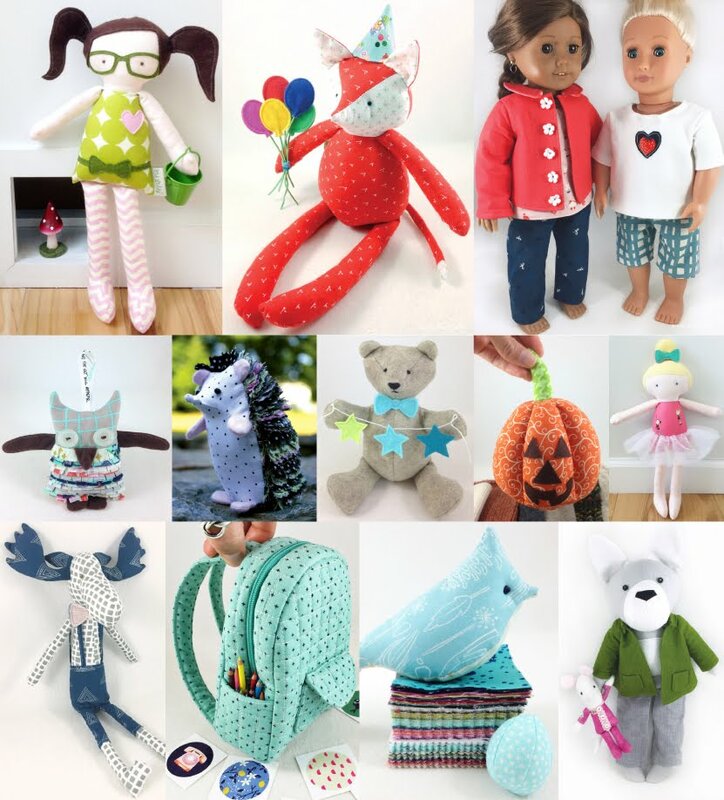 So this fellow crafter (Heidi Boyd), who I met through a fellow crafter (Phoebe) who I met in the karate dojo, mentioned this crafter (Margot Potter). She wrote this detailed series "How to Write and Publish a Craft Book" on her blog, and Heidi recommended that I read it. Thank you Heidi! It is completely chock full of information. And I'm linking it here as my quick reference tool, and I'm also sharing the link here in the hopes that it will benefit some of you too! 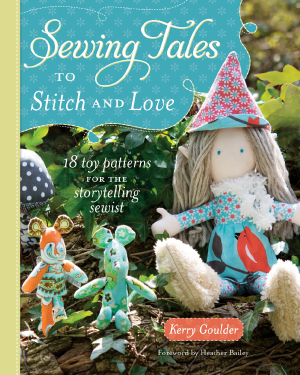 I do believe I am not alone in my quest to be a published crafter! I knew I'd have to submit queries and some of the other basics, but this is really some of the background "stuff"! I love that Margot is journaling for lack of a better word, her experiences as she's working on yet another book! Thanks Margot for letting me share your series! Have a great day everyone! 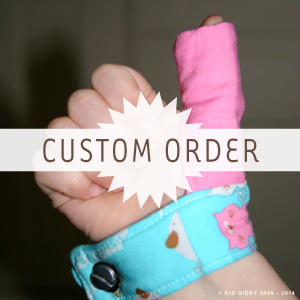 I'm off to keep working on some cute stuffies for my very first craft show! 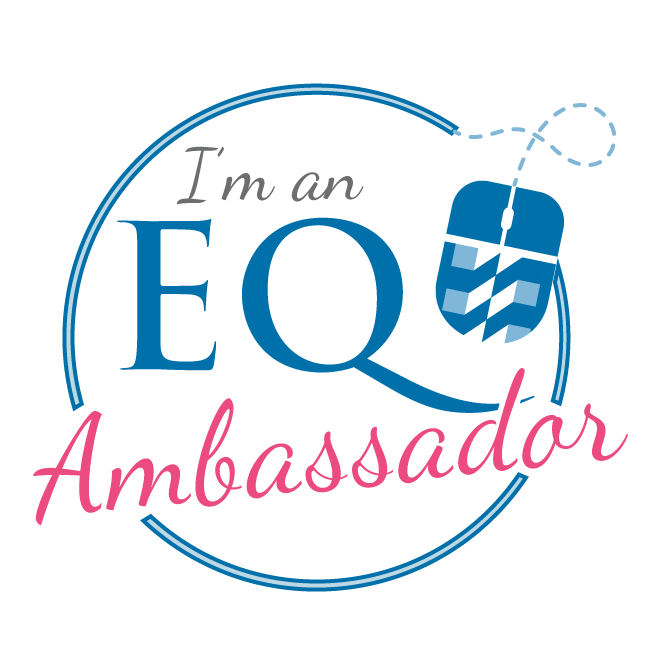 I'll have more on that soon! 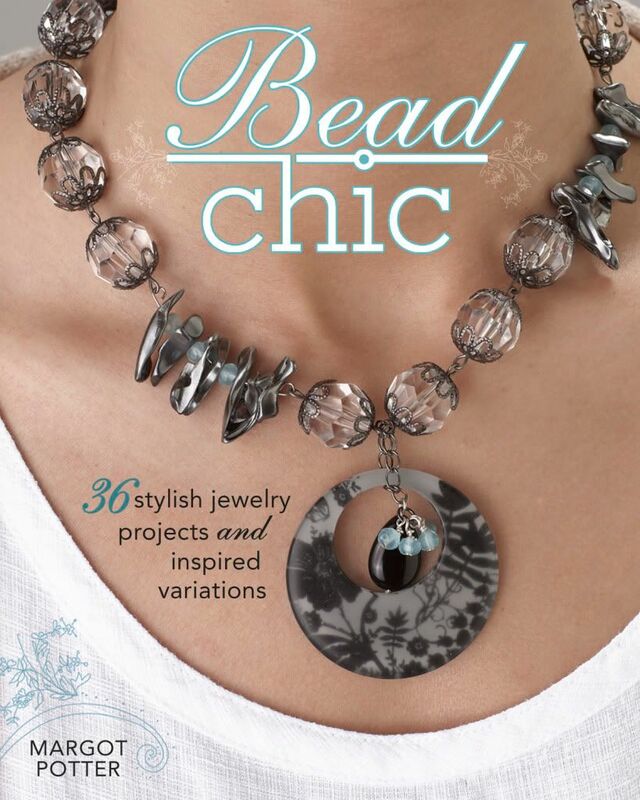 The photo of Margot Potter above and the image of her newest book "Bead Chic" are used with her permission. Maybe it's my love of Texas or our love of Toy Story and my own personal obsession (ok - not that bad! 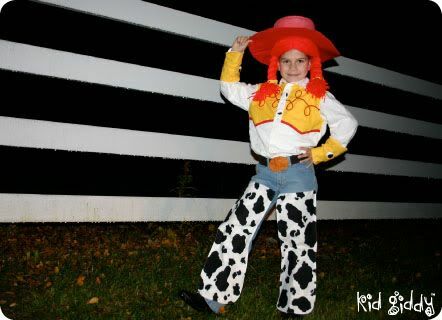 )...of sweet cowgirl Jessie...that made my oldest daughter want to be Jessie this year for Halloween! YeeHaw!!! SO while one girls is a sweet little garden gnome, my other is a ride 'em cowgirl! 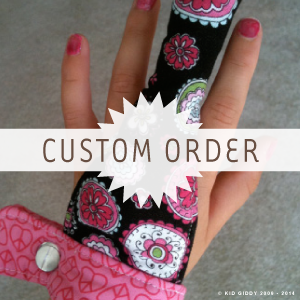 I just couldn't say no and wasn't about to spend $20 or $30 on a cheaply made costume for my sweet Jessie! 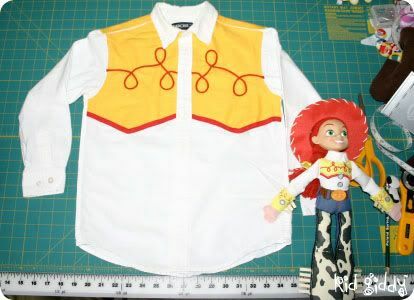 If you'd like to make a Jessie costume, here's how I made it even though Halloween is now past...Giddy-up! 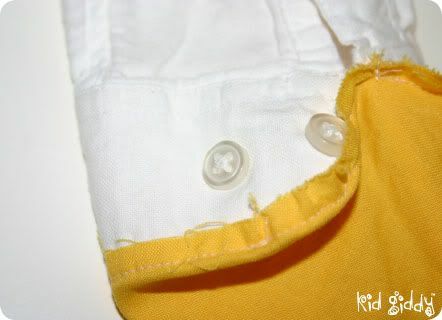 It started with a handed down white shirt and some bright yellow fabric! 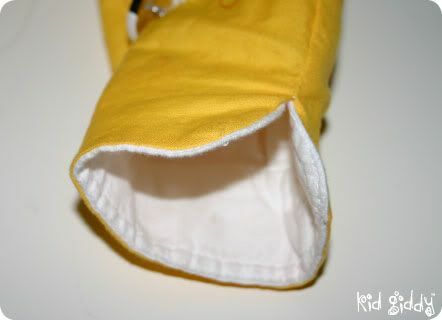 I added a 1/2" twill ribbon along the bottom edge, and a thin rope to create the loopy loops (those were hard to sew). 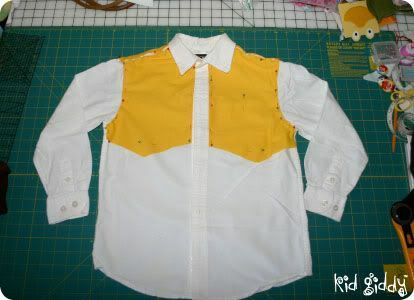 I loosely cut each panel and then pinned them to the shirt, and then sewed it right up against the seam. There is a back panel too, but you just can't see it and I didn't photograph it. Once the cuff is sewn all the way around, sew the raw edges, right sides together. 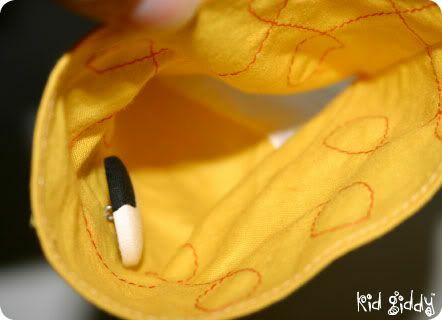 After you have sewn the edge, you need to make some covered buttons (follow directions on packaging) and then sew it on the inside of center fold of the yellow sleeve cuff. Now all you have to do is simply turn it right side out. 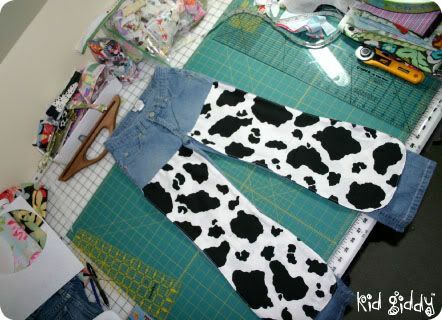 A pair of $5 jeans with cow print fabric! I cut 4 panels and sewed 2 panels, turned them right side out and top stitched them. Then I laid each leg down (flipped up over the waist) handstitched them to the jean leg, and then flipped it back down and top stitched it (by hand also). 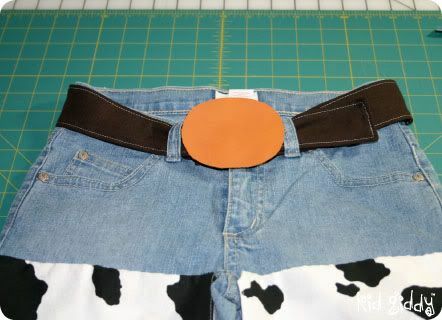 I used brown flannel (that was the only brown solid material I had) and used a piece of scrap leather for the "buckle". I'll post another picture of the finished belt and buckle in the near future! Here's my horrible attempt at a hat...I used a hat box top for the measurement and Pellon stablizer for the hat. 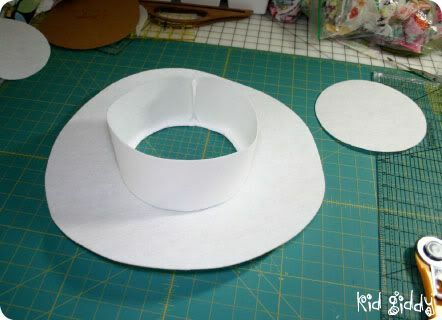 I think this was a 3 or 4" height for the hat top, that I added by machine after cutting out the center. I later attached the top by hand (ugh!) and then used a red fabric spray paint (double ugh!) to the top and ran out by the time I was ready to paint the underneath. (triple ugh!). So I attached red fleece to the bottom (another picture that will be added later). Just an FYI...I bought the wig. It was the only thing I bought. It was called a "Rag Doll Wig" if you ever need to look for one. I took the ponytails out and put the braids in with yellow scrunchies (I didn't have yellow bows). As I'm sure you can tell from my captions above...I wish I had found a hat...but searched high and low and just couldn't find one! Such a bummer! I will add photos later of the shirt sleeves, the finished belt...and another finished picture of the hat - since that was a last minute finish...and still never got to put the white rope loop around the edge! So that's it and I guess I'll be seeing ya'll on the next post! Giddy up! Disclaimer...All of the pieces above were made without a pattern. 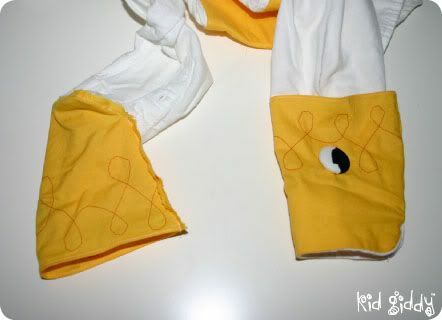 So technically these are Kid Giddy Original patterns and therefore cannot be created for resale purposes. 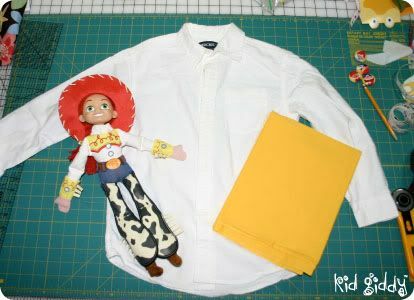 I am sharing this tutorial out of the kindness of my heart to satisfy all the Jessie Cowgirl loving children out there. 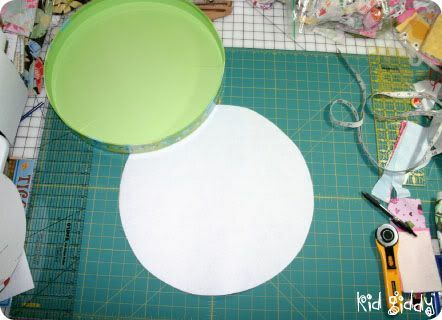 You can use this tutorial to make a costume for yourself or your child. So PLEASE do not copy this and sell it for your own use! Likewise, please do not copy the tutorial by retaking all of your own photos and posting it on your blog as your own. I've seen it happen - so please give credit where credit is due. Thanks!